BOOKING OF A "GITE RURAL"
for the nearest ones, but you may go to Cap d'Agde, Sète also). * 4 Kms from the outskirts of Béziers, and 6 kms from commercial centers . 1 Km from Boujan s/Libron village with many commercial shops, doctors and pharmacy. 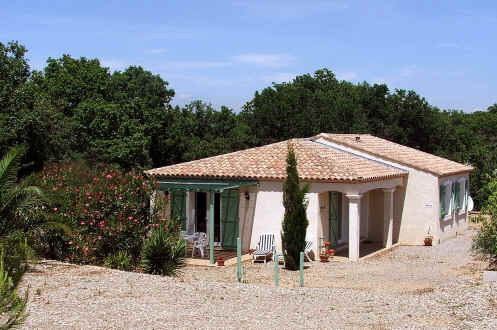 Located in a viticultural domaine, it is a very nice self-contained villa built in 2002. We recommand it for 6 guests maximum. A 43m2 living-room with a very nice kitchen (wash-disher, refrigerator with freezer, electric oven, micro-wave, toaster, electric coffee-pot, 4 gas cooker with hood etc. ), table and chairs, DVD player and satelitte receiver with foreign channels (CNN, Skynews,Eurosport..), radio, sofa + 2 arm-chairs etc. We do not receive anyone after 10 P.M.
We are sure that you will enjoy your stay in our area. Please contact us for any further information you might require.